India's must awaited movie ROBOT 2.0 has been released today. It is the biggest blockbuster movie ever made by bollywood. In this movie the main cast essaying by Rajnikanth as Dr. Vaseekaran , Akshay Kumar as Dr. Richard and Amy Jackson playing the role of another female Robot. In very first day Shankar's new movie Robot is collected huge amount of money all over the world. The first day box office collection in deteils has been provided in the last. The Robot 2.0 is the second part of the movie which was released in 2010 as Enthiran and its bollywood name was Robot. The film was directed by Shankar and in that film the main role had been essaying by Rajnikant as Dr. Vassekaran and chitti (the robot ) and the negative role had been played by Danny as Dr. Richard. And Aiswariya Rai was played a medico and love interest of Dr. Vaseekaran. The Robot 2.0 is directed by S. Shankar , cinemotagrapyed by Nirav Shah and its writter are S. Shankar and Jaymohan. The movie features music by A. R. Rahman and has been dubbed in 14 language. The total budgets has been used to made this movie is 534 Crores which made it the costliest movie ever in bollywood. In this movie Dr. Vassekaran is made a Robot which name is Chitti and in the opposite Dr. Richard also did an experiment on himself and became a dangerous Crow Man by any mistaken and tried to killed people. To save the world from Dr. Richard rougue by killing people Dr. Vaseekaran used his Robot Chitti and Amyjackson also helped Dr. Vassekarn as another female robot from Dr. Richard gone rouge . 2.0 also seen a massive theatrical release in the US, released in 800 theatre in abroad. The tamil version has been released in 307 theatres , telegu 270 theatres and hindi in 223 silver screens. As per reports, the first day collection for the film 2.0 at box office was huge. The Hindi film scored around 23 Crores, while the film in the film went on to score close to 70 Crores. Thus the total box office collection was huge. 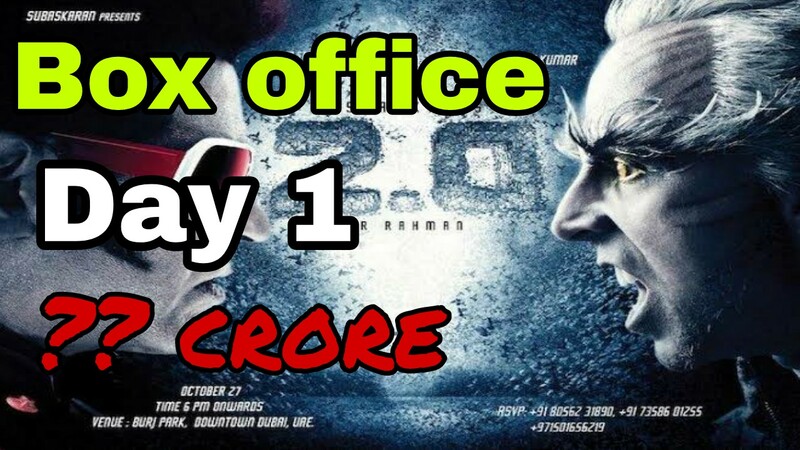 As per reports, the 1st day box office collection for 2.0 was around 93 Crores, which is huge and goes the same way in the coming days. Going with the same buzz, the collection will cross 300 crore mark on the first weekend. The movie program brings many movies in your collection, regularly updating terrariumtvultimate.com movies, allowing people to download the best android terrarium ever.